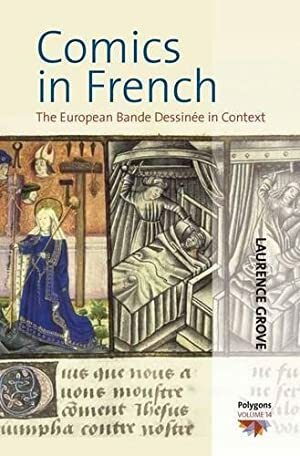 Once upon a time, Francophone Europe had a strong, lively fantasy literature. Landmark early authors include Jules Verne (1828-1905) or J.H. Rosny aîné (1856-1940) . This scene was demolished by the World Wars, particularly by the second. By 1945, it felt as if it never existed. Thus, when people wanted to tell such stories again, they drew from Anglophone material. Of particular influence were strips such as Flash Gordon (Alex Raymond’s strip, published in the US from 1934 onward) or his contemporary Brick Bradford . 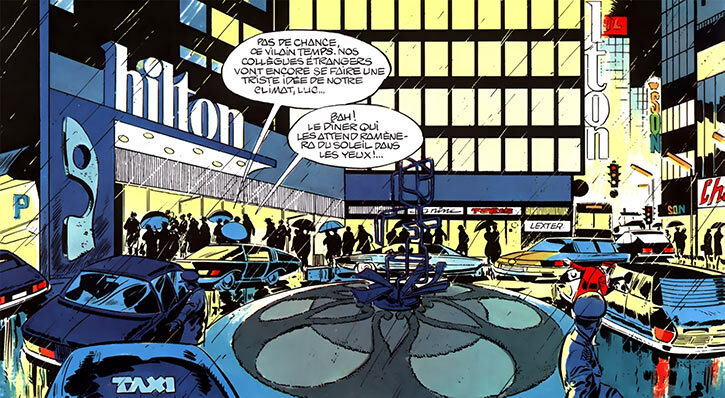 Bande dessinée (comics) became big after the war, particularly from the 1950s onward. Most were detective stories, historical stories, and the like. Luc Orient was created to fill a puzzling lack in science-fiction stories. 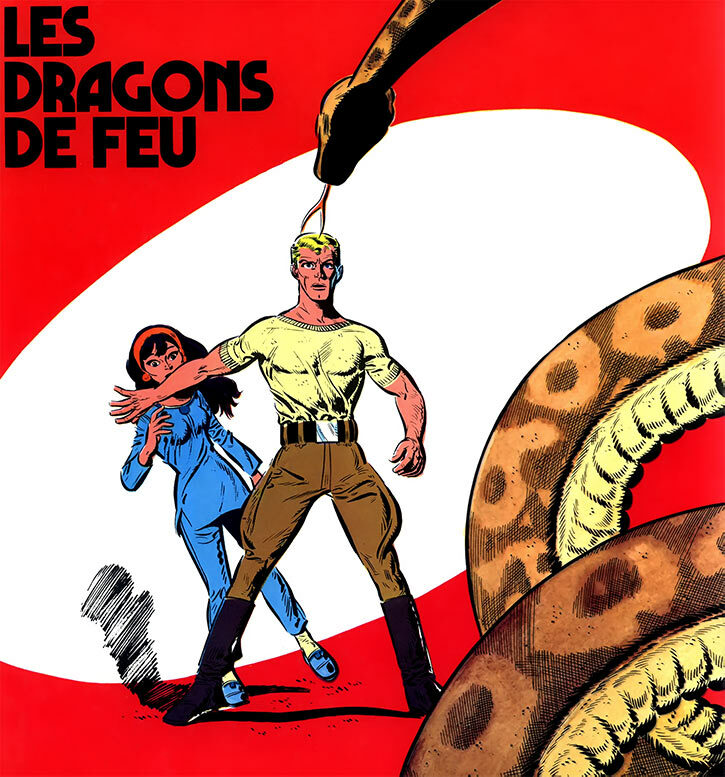 It was very much a Francophone Belgian 1960s Flash Gordon. Luc Orient was the brainchild of major author Greg , and his friend artist Eddy Paape. Orient appeared in 1967. 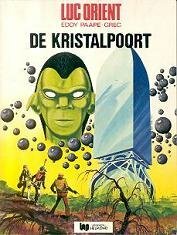 That was 10 years before Star Wars, so “science-fiction” was more Earth-centric back then. The Luc Orient stories were successful, and remain (dated) classics. 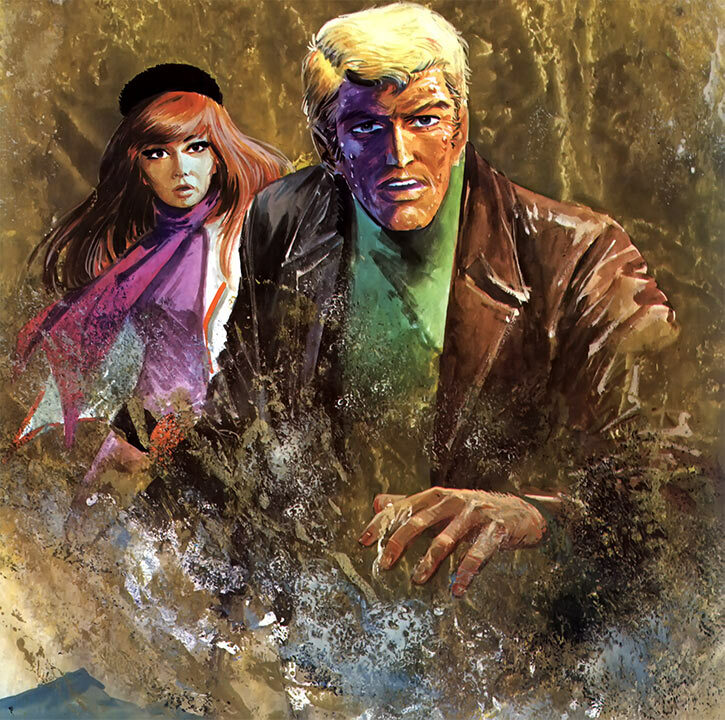 Other major late 1960s comics heroes with a sci-fi theme include Bob Morane (because Mr. Morane has been everywhere and has done everything) and especially Yoko Tsuno (though Ms. Tsuno’s adventure feel markedly more modern than Mr. Orient’s). 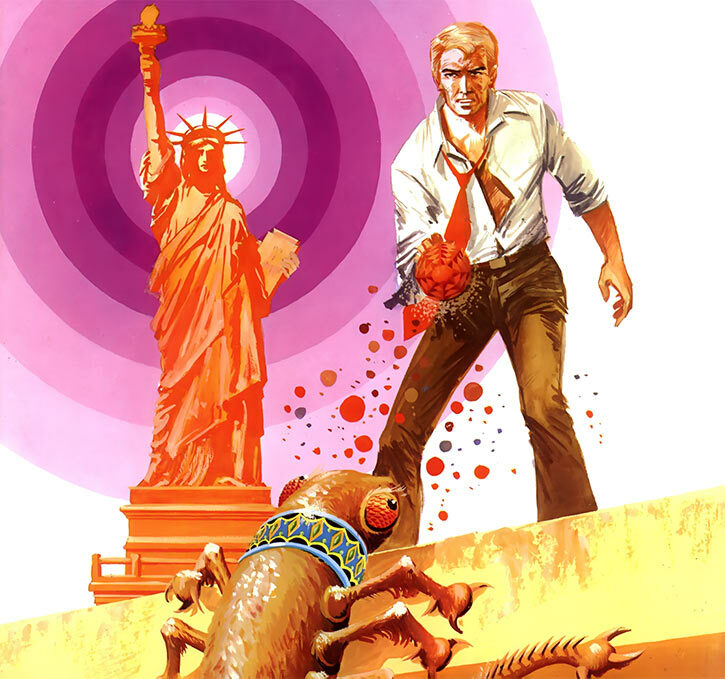 Luc Orient’s adventures continued to be published and collected until 1994, with a total of 18 graphic novels. It wasn’t a #1 seller, but it is well-remembered. Due to time constraints, this only covers the first half of the material. That’s ten graphic novels, from Dragons of fire to The sixth continent. It has S P O I L E R S for everything therein, but that presumably matters little for most readers. This profile has a companion entry. Fittingly, it profiles Luc Orient’s companions. Other Aliases: Laurent Gérard (light cover identity). Group Affiliation: Employee at Eurocrystal One. Base of Operations: Eurocrystal One, presumably in Belgium. Height: 6’2″ Weight: 185 lbs. Luc Orient is clearly a man of action. He knows about weapons, wilderness survival, hand-to-hand combat, vehicles, etc.. Generally speaking, he’s a capable, low-cinematic adventurer. He also received a scientific education – physics and chemistry are mentioned. He almost certainly has a military background, which includes demolitions. Orient seems to have received specific training in meteoritics, and has significant experience in recognising meteoritic materials. It is is possible that checking meteorite impacts is a good part of his professional routine. Such everyday cases wouldn’t be depicted in the graphic novels. While in a strange state of sleep/trance, Luc and his companions were taught two languages. One was used by remote jungle tribes in an unclear part of the Indian subcontinent. 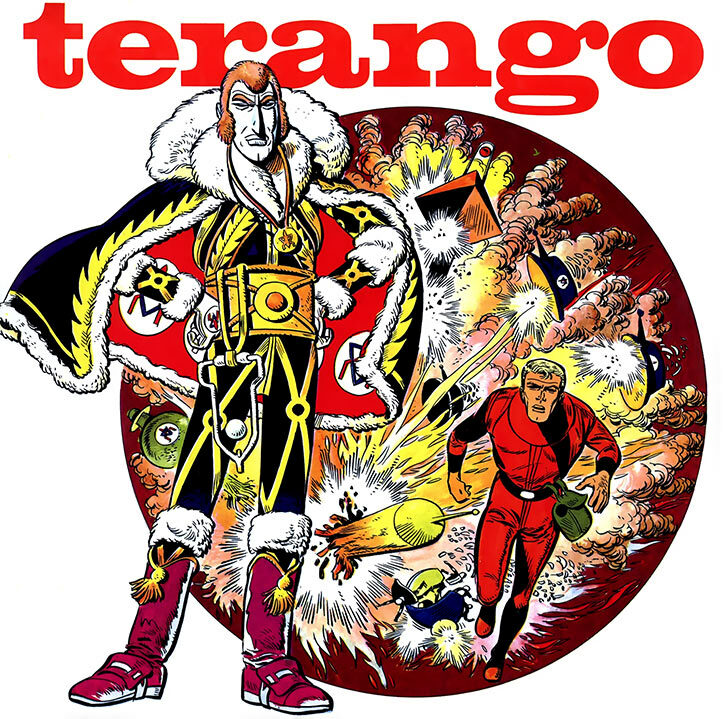 The other was the main language on the planet Térango, used by most sapient humanoids there. Before reaching Térango, the four companions were also altered to breathe a much wider range of atmospheres. This doesn’t include near-vacuum or corrosive conditions, but they can harmlessly and indefinitely breathe atmospheres that should kill them within minutes. It also enhances their ability to function underwater. Eurocrystal One is a large, prestigious scientific research facility with a futuristic design. It is reportedly the most advanced, modern research lab in the world. It is “in Europe” without further precision. I’d assume that it is in Eastern Belgium, but it’s deliberately murky. The star researcher at Eurocrystal One is Professor Hugo Kala (presumably a reference to Kalla Kopak in Brick Bradford). He is considered the sharpest scientist in the world. Kala is famous and influential. Among other things, Kala’s lab investigates all sorts of fringe scientific theories. The job is to assert whether they are deluded, or on to something. Eurocrystal One’s higher-ups can coordinate military forces as part of special emergency response plans dealing with abnormal happenstances. They also have a privileged relationship with law enforcement. Eurocrystal One is part of an international network of similar labs. The network is simply called the ISC (International Scientific Community). They have similar “no questions asked” emergency plans with the military and law enforcement agencies of their countries. The ISC has a network of coordination centres, presumably on a continental scale. Mr. Kala has two younger aides. The first is Lora Jordan, who seems to be a combination of personal aide, lab technician and nurse. The second is Luc Orient. He seems to have been specifically assigned to Kala in the expectation that the formidable genius would need a man of action to accompany him in the field. The trio is soon joined by a professional guide from India, Toba. Toba becomes a part of most of their adventures. One city scene taking place “in Europe” has a curious mish-mash of languages in signs and first names. Perhaps the European Union proceeded much faster in Luc Orient’s world, and Brussels became even more of a multicultural metropolis. That would also explain why the world’s most advanced labs complex is in Europe. The numberplate on Orient’s car is also weird. Various details also seem out of place for the late 1960s. In some cases it may just be retro fashion choices (such as Lora’s 1930s headbands early on), but many details are more akin to the late 1940s or early 1950s. By the same token, as the series progresses the cars are increasingly drawn with futuristic lines. These are close to period European concept cars such as the Citroën Karin , or the Alfa Romeo Carabo . This is specific to cars – trucks seem normal, as do helicopters. For the latter, a Sikorsky H-34 is clearly seen. OTOH, a Eurocrystal One helicopter is seen that looks like a MBB BK117 , which was but a prototype when the story was published. So generally it would seem that it’s not quite the real world. There are small touches of 1970s futurism here and there. 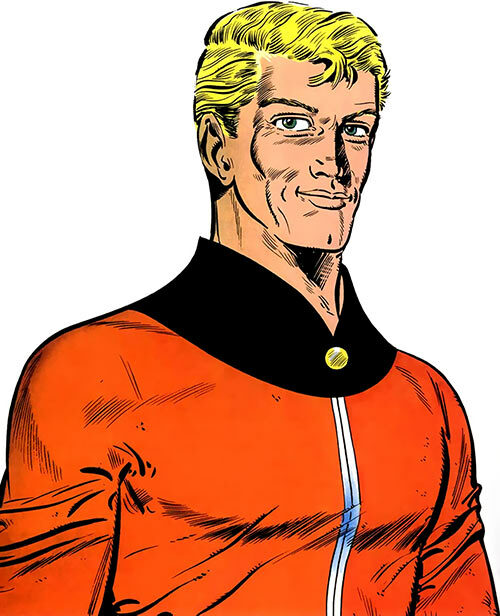 And it stands to reason that this Earth has been through a number of “weird science” crises (Flash Gordon stuff, maybe ? ), though these were kept secret. But there’s no attempt at world-building. And the little anomalies likely are artistic whimsy. The seminal encounter for Kala’s team was stumbling upon space aliens. This took place in primeval jungles in or near the Indian subcontinent (in the graphic novels Dragons of Fire and Suns of Ice). A geologist had just found samples of an extraterrestrial metal there, emitting deadly radiation. He only narrowly survived the trip back, but specifically wanted Professor Kala to handle his incredible find. Rumours had long existed about this metal. Thus, Kala had already theorized about its properties, calling it the “integral metal”. Field research and collaborating with local forest tribes established that three UFOs had landed in the area thousands of years before. But things had gone wrong, and most of the alien crew hadn’t awakened from suspended animation. Kill a huge, mutated liger that had been a thorn in the locals’ side for centuries. Establish a good relationship with them. Map out how the amazing flora and fauna in this remote area was tied to unwittingly released alien radiation. All the while, the four adventurers narrowly fended off the malfeasance of Doctor Julius Argos, Kala’s sinister arch-rival. The revived aliens returned to Térango, their home world. What they found there was disastrous. During the centuries since their departure, a tyrant had taken over. The new regime was far more aggressive. The outdated scientific expedition members returning from Earth were now exiles. Fearing aggression from Térango, they returned to Earth to warn their friends. Alien leader Galax-Ahj and Professor Kala agreed that warning Terran authorities would likely be counter-productive. Galax-Ahj thought that the best approach was to depose the tyrant Sectan, so as to return Térango to its peaceful culture. As he saw it, allies from Earth could employ alien tactics and low-tech measures, against which the impressive security of Sectan would be ill-adapted. And since Terran bodies circulated blood rather than energy, they could completely ignore many Terangian weapons and security measures. Professor Kala was of course reluctant to go with this plan, unlike Orient. But the European military overreacted to UFO sightings, forcing his hand. After grabbing go-bags and supplies from Eurocrystal One Luc, Lora, Hugo and Toba left for Térango. During the journey, the advanced Terangian medical process to allow them to breathe the alien atmosphere went awry. But everyone survived. Once on Térango, the scientific crew destroyed their ships. They then hid in an underground city run by fellow Terangian dissidents. From there, the Earthlings were narrowly infiltrated into the capital. There they took nearly fatal risks to place powerful explosives on the interstellar war machines built for Sectan. Due to Térango’s odd atmosphere, the explosives ravaged the whole arsenal and put Sectan’s entire forces into disarray. Though a strong blow had been struck, the dissidents were still markedly outgunned. They also wanted to avoid any reprisals against the non-aligned population. This left one main solution. Térango was home to several sapient humanoid species. However, the non-dominant ones wanted to be left alone by the “main” Terangians. They maintained low-tech, isolationist tribal lifestyles. But they too were threatened by Sectan. Therefore, it was possible to convince them to ally with the dissidents… if a way could be found to overcome their dour hostility toward other species. Luc, Lora and two dissident Terangians left for the deadly bayous. After facing daunting dangers and vanquishing a small-time tyrant, they gained the support of the Dragon People and the People of the Peaks. Having Earth allies proved a shrewd move. The Earthlings were immune to many local weapons, and the “main” Terangians had but negligible military experience. Sectan’s dictatorship also emphasised mindless obedience and brutality, leaving little room for proper tactics. But Sectan counter-attacked by recruiting Doctor Julius Argos. 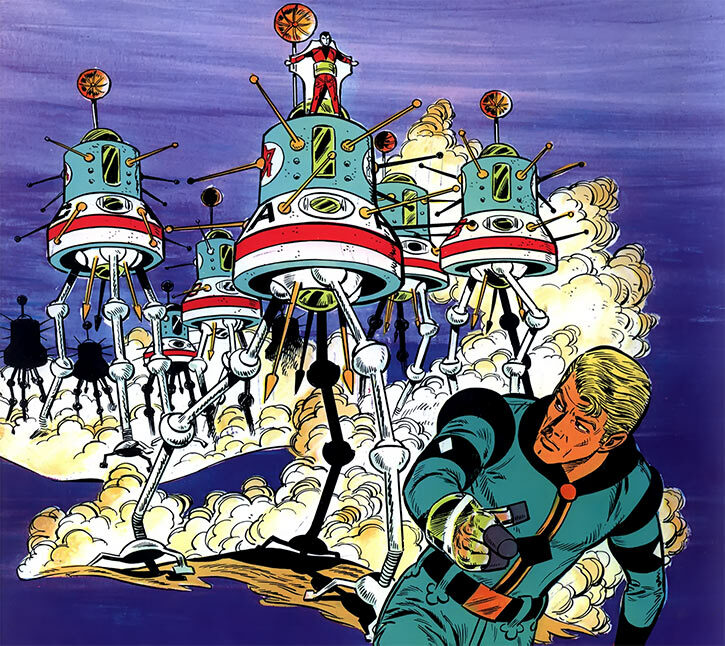 Argos came up with a despicable plan using heavily armed war tripods, hostages, and cavemen from Earth (long story) turned into living radioactive bombs. However a combination of Kala’s genius, Orient’s courage and newcomer Argos’ poor knowledge of the strange conditions on Térango foiled the awful assault. The underground infrastructure technicians at the capital then rose up. With the help of the Dragon People, the People of the Peaks and the dissidents, they took control of most of the capital. Hastily repurposing the war tripods, the Earthlings demolished Sectan’s last arsenal. Sectan himself was about to gun down Luc when Toba threw his keris knife, killing the tyrant. Kala brought back a number of samples from Térango. Some of these came from ancient Terangian scientific expeditions to distant planets. Kala had a theory that being exposed to exotic lights would completely change the visual properties of objects. He thus obsessively worked on using these materials to simulate the light of exotic stars. This indeed transformed the visual appearance of objects. However, a minor accident convinced Kala to slow down and better assess his tech. At that point, he had built seven projectors, each emulating a different star. Luc and an eccentric, somewhat senile researcher goofed around with the projectors anyway. As a result, Luc and Lora were both exposed to the seven exotic lights simultaneously, for several minutes. They miraculously survived but were now weirdly out of synch with Earth physics. Luc could phase through solid objects, and Lora tended to disintegrate what she touched. Kala took them to one of his hideouts, since his two aides now held enormous potential for destruction. Then he and Toba used the projectors to transform food so that Lora and Luc could touch it, and not starve to death. However, Kala’s isolated hideout turned out to be a short distance away from a chalet. Which was where mobsters came to hide a kidnapping victim. Luc and Lora attempted to rescue the kidnapped brat, but the situation degenerated into a mob war. Though his power of intangibility was fading, the ghostly Luc used the mobsters’ superstition against them. This delayed them long enough for the gendarmes to arrive. Kala then ensured that both his aides survived losing their temporary powers. In 1974, a curious aerolith crashed not far from a mountain hamlet. Orient and Jordan were sent ahead to check it out, and prevent locals and journalists from getting poisoned by exotic compounds. Kala and a larger crew would follow some days later with lab trucks. However, the villagers were scared. Grisly murders started plaguing the hamlet, and somebody cut off the only road using explosives. Orient also determined that the siderolite’s core was an unknown, extraterrestrial alloy emitting a strange gas. The locals (and to an extent Orient and Jordan) came to fear than an invisible alien killer was among them. Luc was nearly killed in an apparent alien attack. Hours later, Lora seemingly went insane and attempted to stab him to death. After getting knocked out, she awoke without any recollection of this episode. At this point, airborne troops came in via helicopter and gassed everyone unconscious. As it turned out, the gas was a powerful hallucinogen. All killings had been done by hallucinating villagers, without them realising it. Eurocrystal One released a fake report, blaming an imaginary prowler that had then been killed by the gendarmes. Thus the hamlet’s survivors wouldn’t have to live with the guilt of having unknowingly murdered their loved ones and neighbours whilst hallucinating. In 1975, there were multiple medical reports about toddlers demonstrating superhuman strength, coordination and intelligence. Of course, Kala knew about it already. He had secret files about unethical attempts at eugenics to create superhumans. Thus, he thought that someone, somewhere was now making these awful plans a reality. The toddlers (all born within a few months of each others) were indeed superhuman. But Kala feared that they weren’t viable due to the reckless experiments behind their abilities. Furthermore, Kala’s eugenics documents were stolen at Eurocrystal One, and Orient but narrowly prevented the kidnapping of one of the babies. The kidnapper, a former student of Kala, fell to his death. Investigation unearthed the commonality between the mothers – the Angels Inn, a posh mountain hotel. Orient, Kala and Jordan infiltrated the place under light cover. They soon exposed the megalomaniacal Dr. Soriack. The unhinged physician planned to supplant humanity with homogeneous supermen, a new breed that would unthinkingly obey him. 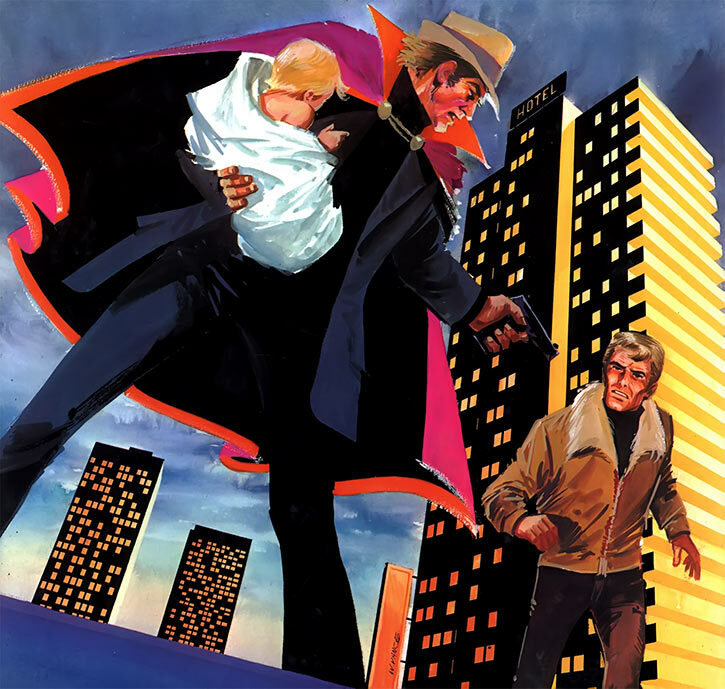 With the police’s help, the Eurocrystal One team took down the criminals and rescued the babies. From there it was possible to gradually depower the toddlers, which also saved their lives. Mere months later, a colourful character calling himself “the Devastator” started sending threats to governments. Most thought that his rants were utter nonsense, but Kala realised that this man was making precise references to cutting edge physics. Tired of being treated like a joke, the Devastator then remotely disintegrated a large bridge before stepping up his demands. Orient and Kala determined that the deed had been committed using extraterrestrial bacteria. The Devastator started a 24 hours deadline before his next strike, but the UN refused to believe Kala’s explanations. Meanwhile, Eurocrystal One determined that the alien bacteria could be destroyed by exposure to human blood. Automatic small arms projecting capsules of artificial blood plasma were hurriedly prepared. Though the Devastator destroyed the Statue of Liberty, Orient and two other shooters could deploy in time with these weapons to save Bedoe Island. Orient also determined that three aliens were present on Earth. They had been considering uplifting humanity, but a violent conflict had arisen. One (the “Devastator”) wanted to destroy humanity. The second eventually agreed. But the third couldn’t accept that and allied with Luc Orient. In the end, only the more-or-less benign alien survived. However, he had to sacrifice part of his existence to stop his renegade colleague from destroying Earth’s atmosphere. He was thus stuck in the ersatz human body he had been inhabiting to facilitate infiltration. In 1976, Professor Kala and Toba were investigating in the Swiss Alps. A researcher had gone missing there whilst investigating mysterious activities. Kala also vanished in odd circumstances, and Toba called in Luc and Miss Lora. They eventually discovered the hidden civilisation of Hymenopteria, a.k.a. “the sixth continent”. A sportive young man, dressed fashionably (for the times). 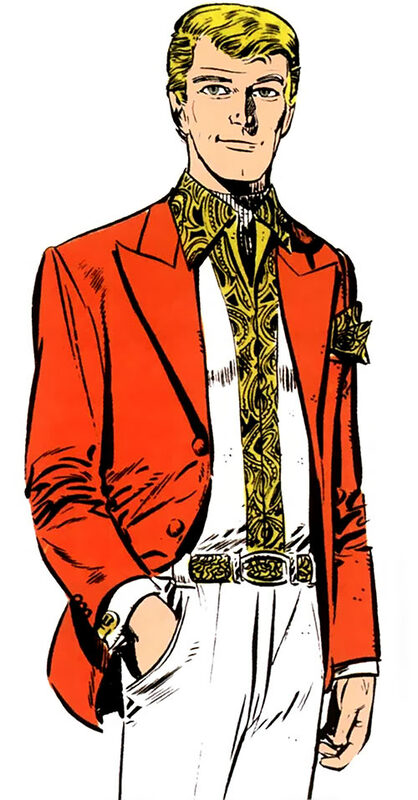 He has a vague upper class vibe in his sartorial choices. While muscular, Orient certainly isn’t bulky. He relies more on fitness and precision than on muscle. By the standards of his day, he’s unusually tall. He has a not-insignificant likeness to a young Roger Moore. Back then, Moore was known for playing Simon Templar on the popular TV show The Saint. Orient is a charismatic man, and people almost always like him. Even when there’s an impenetrable language barrier, people often react well to his exotic looks (tall and slender, with blond hair). He smokes cigarettes, but in moderation. A brave, clear-eyed man of action. Luc is always unto the breach to defend the common good and scientific discovery. Early on Orient has an abrasive, smirky, flippant side. He tends to tease the people around him. This is a consequence of boredom, and not feeling challenged enough by his then-current lifestyle. Once he can cut his teeth on a tough field mission, Orient acts in a noticeably more mature and focused manner. Once in the field and in the zone, Orient is a real go-getter. He also feels responsible for the safety of everyone around him. However he retains a sarcastic and unbelieving side when faced with strange happenstances. Orient shares Kala and Jordan’s humanistic values. He’s less of a pacifist than they are, but will almost always agree to try Kala’s harm-reducing approach first. He’s also reluctant to kill people, unless that would immediately save somebody else’s life. Early on Orient has a paternalistic, colonialist attitude toward low-tech populations. He treats them a bit like children, and takes their help for granted. This is fairly typical of his day. But more remarkably, he also detests overt racism. In general, Orient hates abuse, injustice and tyranny. He never hesitates to take enormous risks for no other reason than to defend the underdog, or to save lives. Luc Orient and his companions could credibly exist on the fringes of an American comic book world. This works best if their career mostly takes place during the early Silver Age , when the world is not yet awash in powerful superhumans, alien invasions and dimensional crises. 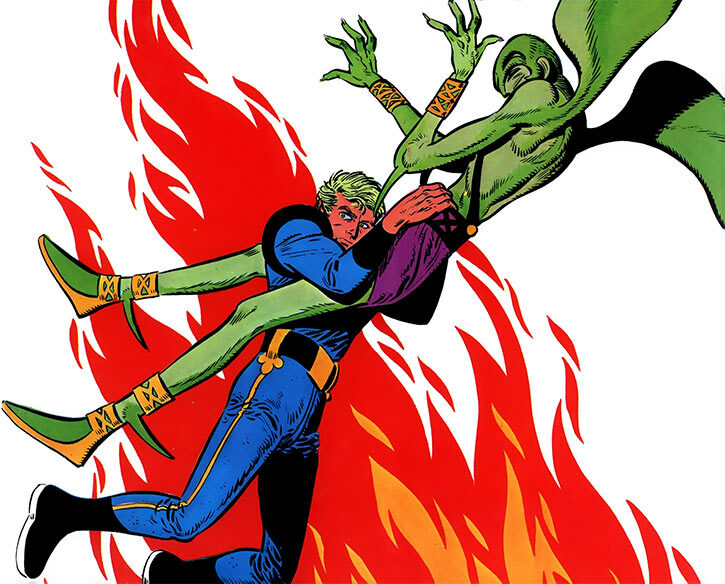 Y’know, the era of the Challengers of the Unknown (and Challengers-Haters), Cave Carson, the Sea Devils, the Silver Age Suicide Squad… those guys. Eurocrystal One could have become the new headquarters of the Dome after a reorganisation. And heh, perhaps Lora became Belphégor. An obvious twist would be for Luc, Hugo, Lora and Toba to eventually become a Fantastic Four-style superhuman explorers team after exposure to exotic elements. This niche isn’t quite filled in the classic DCU. And as a Belgium-based team they wouldn’t interact with American super-heroes that frequently. Credentials (Eurocrystal One, Low), Expertise (Meteoritics), Familiarity (Zoology, physics, chemistry, parachuting, military equipment and procedures), Financial Backer (Rich), Language (Unspecified language from remote Indian jungle tribals, main Terangian language, French), Life support (Thin atmosphere, toxic atmosphere), Schtick (Burst of strength). For an expedition in untamed wilderness, 1960s Orient will have a Colt Police Positive (.38 revolver stats) and either a repeater shotgun (likely a Browning Auto-5) or an unidentified bolt-action rifle (possibly a Mauser 98 civilian variant). Orient usually drives a then-modern, fast sports car. It comes with medical equipment (including oxygen tanks and a hospital mask), scientific investigation supplies, and a Walther PPK in the glovebox. In 1976, Orient had an unidentified compact semi-automatic. He and the team were also using tiny radios with a 5+ kilometers range. 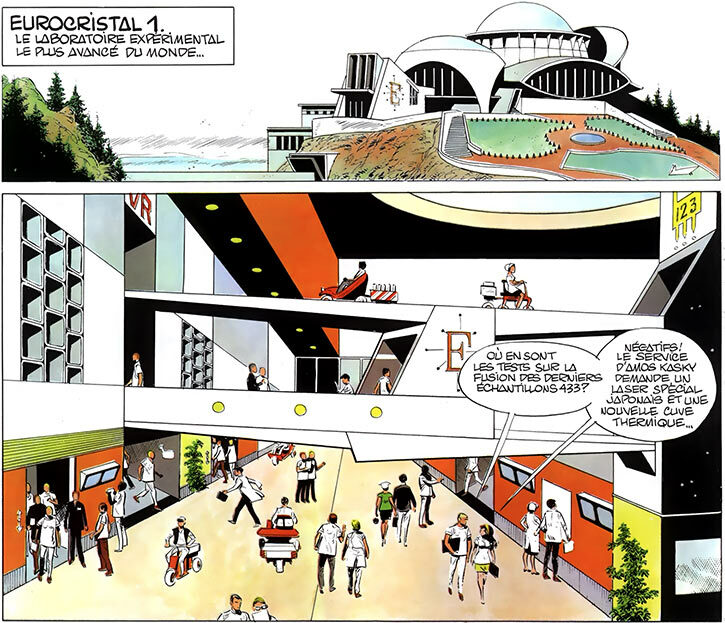 Source of Character: Luc Orient graphic novels. Writeup completed on the 7th of January, 2018.